NIOSH N95 rated mask provides protection from dust, metal fumes, microorganisms, and non-oil containing fumes. 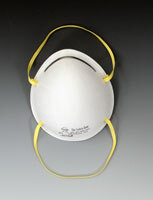 Flexible nosepiece fits any facial contour. Provides at least 95% filter efficiency.